This post contains minor spoilers for Spider-Man: Into the Spider-Verse. No Marvel movie would feel quite right without its traditional Stan Lee cameo. True to form, the larger-than-life Marvel Comics writer, producer, and father of many of today's most beloved heroes -- who died November 12 -- makes his first posthumous appearance in Sony's Spider-Man: Into the Spider-Verse. A small spoiler warning for those of you who aren't familiar with Miles Morales' Spider-Man storyline: in the comics, Miles canonically gains spider-powers and becomes the new Spider-Man after he watches Peter Parker die at the hands of the Green Goblin. In the new movie, as all of New York mourns their fallen hero, Miles walks into a comic store to buy a Spider-Man mask. Behind the counter, of course, is Stan Lee. "I'm going to miss him," Lee sighs as he rings up Miles' purchase. Later, as the boy turns to leave the store, he calls after him: "It always fits eventually." It's a meta little bit of torch-passing: the image of Stan Lee giving his blessing to a new generation's superhero, the successor to the iconic character he co-created with Steve Ditko in the '50s, who was the face of Marvel for so many years. Not only does his death make the scene all the more touching, one of the movie's directors mentioned that he recorded those lines back in 2017, just weeks after his wife, Joan Lee, passed away. "There was already this melancholy layer to it," director Peter Ramsey said about recording the scene with Lee. "The scene itself is about mourning the passing of someone you knew and loved, and at the same time passing on their legacy to someone else. So, to watch the scene now and realize that Stan, in effect, gave his blessing in this movie about the passing of the torch to Miles as a cinematic version of Spider-Man, after his own passing… it really kind of blows me away how many echoes and resonances there are." It's maybe unlikely that this will be Lee's final Marvel cameo: There's a chance he could also show up in Avengers: Endgame, Captain Marvel, Spider-Man: Far From Home, or even Dark Phoenix and The New Mutants, all of which have either wrapped filming or filmed the majority of their scripts already. He even makes an appearance (but doesn't actually speak) in Ralph Breaks the Internet. 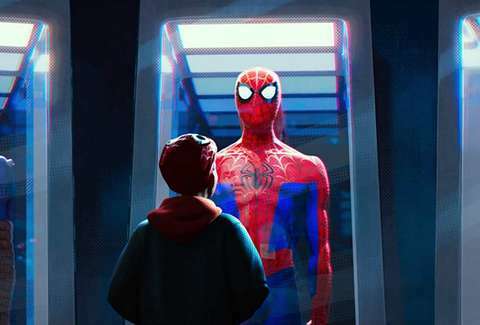 But his scene in Spider-Verse is something special, a fitting way to show how our greatest creators can live on in the creations they loved the most.